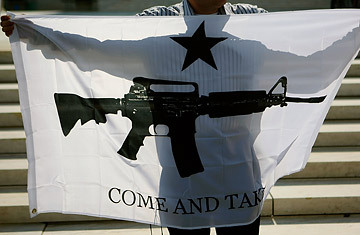 A gun rights activist in Arlington, Virginia, holds a banner while standing in front of the U.S. Supreme Court after the decision was announced on the District of Columbia gun ban in Washington, D.C. The U.S. Supreme Court's 5-4 decision overturning Washington, D.C.'s handgun ban is the biggest gun rights ruling since the Second Amendment was ratified in 1791. The Court had not waded into this divisive issue since 1939, when it declared, "We cannot say that the Second Amendment guarantees the right to keep and bear" arms. But on Thursday the Court broke its silence to do just that, ruling for the first time that the Constitution confers an individual right to gun ownership beyond providing for "a well regulated Militia," as the amendment states. The Constitution does not permit "the absolute prohibition of handguns held and used for self-defense in the home," Justice Antonin Scalia, the court's arch-conservative, wrote in the majority opinion. Gun-control advocates say the ruling's focus on gun bans safeguards reasonable gun restrictions from the flurry of litigation it will undoubtedly trigger. "The Court's decision indicated regulation of guns, as opposed to the banning of handguns, is entirely permissible," says Dennis Henigan, vice president for law and policy at the Brady Center to Prevent Gun Violence. "The ruling gives a constitutional green light to a wide range of gun restrictions." Scalia said the Court's decision "should not be taken to cast doubt" on many existing restrictions against gun possession, including handgun possession by felons and the mentally ill, possession in schools and government buildings and rules governing commercial arms sale. Says Henigan: "I don't think that there is any federal gun control law that's likely to be struck down." In tackling these thorny legal questions, the Supreme Court had to grapple with the Bill of Rights' most puzzling item. The Amendment reads: "A well regulated Militia, being necessary to the security of a free State, the right of the people to keep and bear Arms, shall not be infringed." Its confounding syntax aside, Scalia said the fact that the Amendment is framed in a military context is "unremarkable" given the era's martial climate. His argument, says Northwestern Law School professor John McGinnis, is rooted in the judicial philosophy of originalism: "When there really isn't clear precedent, you look at what this meant at the time," McGinnis says. "Scalia's point is that there's nothing to suggest [that arming state] militias exhausts the scope of the clause." In one of two dissenting opinions, Justice John Paul Stevens called Scalia's argument "strained and unpersuasive." He also blistered the majority for its expansive reading of the Amendment's "ambiguous" text. "Until today, it has been understood that legislatures may regulate the civilian use and misuse of firearms so long as they do not interfere with the preservation of a well-regulated militia," Stevens wrote. "The Court's announcement of a new constitutional right to own and use firearms for private purposes upsets that settled understanding." Instead of rendering the Second Amendment a dormant law, the Court's ruling has given it life. "It is not the role of this Court to pronounce the Second Amendment extinct," Scalia wrote. That view aligns the Court's conservative wing with most current scholarly interpretations, says Barnett, the Georgetown professor. But despite finally affixing its imprimatur on a reading of the convoluted Amendment, the Court's ruling raises nearly as many questions as it settles. As Justice Stevens wrote, it "leaves for future cases the formidable task of defining the scope" of its impact.